STEM Out! is for young women who are interested in future careers in Science, Technology, Engineering and Math. 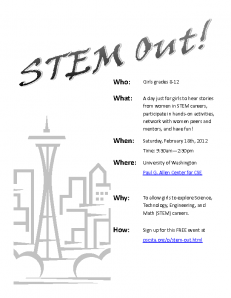 A day just for girls to hear stories from women in STEM careers, participate in hands-on activities, network with women peers and mentors, and have fun! Explore your possibilities and meet other women who are interested in these fields.